Workers renovate sections of the interior of Hagia Sophia. 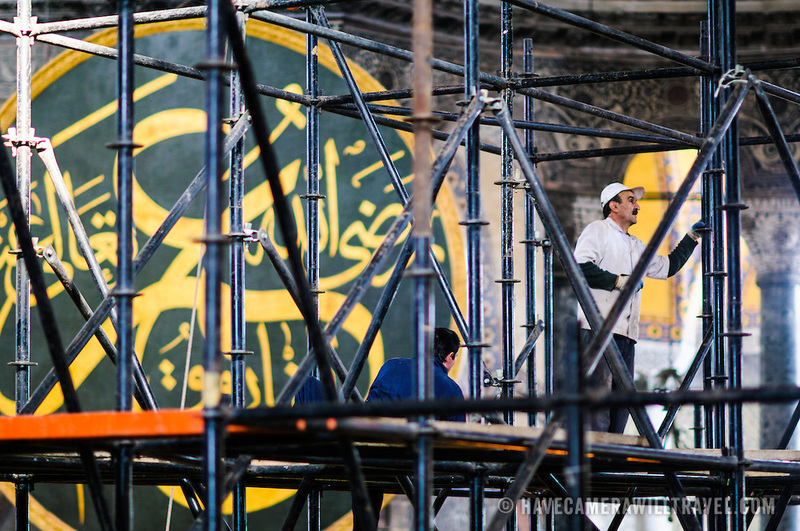 In the background is one of the massive calligraphy medallions on the wall. With such an old building, renovations are almost constant. Originally built as a Christian cathedral, then converted to a Muslim mosque in the 15th century, and now a museum (since 1935), the Hagia Sophia is one of the oldest and grandest buildings in Istanbul. For a thousand years, it was the largest cathedral in the world and is regarded as the crowning achievement of Byzantine architecture.